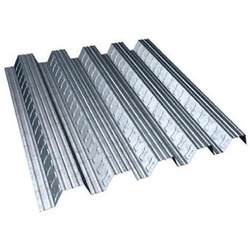 Our range of products include decking sheet for thermal power plant. Decking Sheet for Thermal Power Plant offered find use in Thermal Power Plants and some in optimum weather resistant and corrosion resistant finish. Providing for high working efficiency, these are also easy to install and come bonded to concrete through use of moulding on sheet that stops the concrete from slipping. Being extensively used for roofing applications, we can make these available in varied sizes and designs so as to suit roofing and decking applications. Further, the sheets also deliver strong and reliable shear bond performance. Looking for Decking Sheet For Thermal Power Plant ?